It's not easy to mock vegetable juice, and seeing how it's healthy and good for you, why would I? 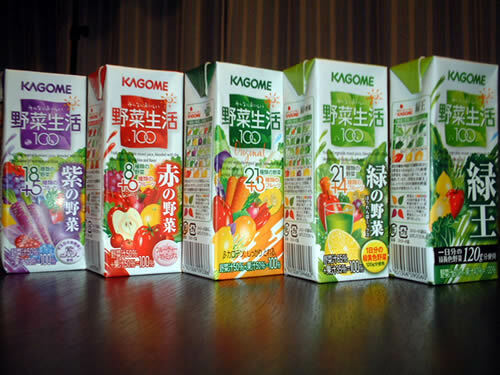 Kagome's 'Vegetable Life' brand of vegetable/fruit juice has been around for a while, but recently they've added a few new flavours, and have been stepping up the marketing campaign considerably. For example, the other day I rode the 'Kagome' train. Sometimes companies buy up all the advertising space on one train so the train is like one huge billboard. Kagome had posters and stickers up everywhere, short video ads running on the monitors, etc. The only thing they didn't do was have cute girls in uniforms walking around giving out free samples, which is of course why Mike's Blender is around! 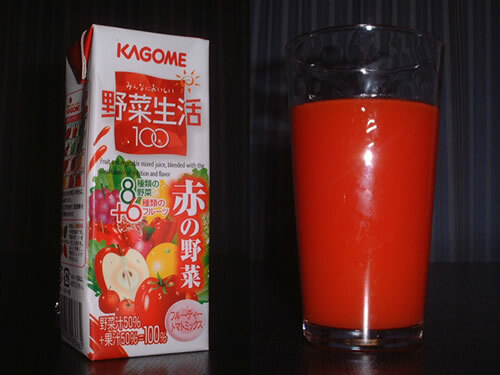 Tomato juice has long been available, if not too popular in the West, but here in Japan they've taken it to new levels. 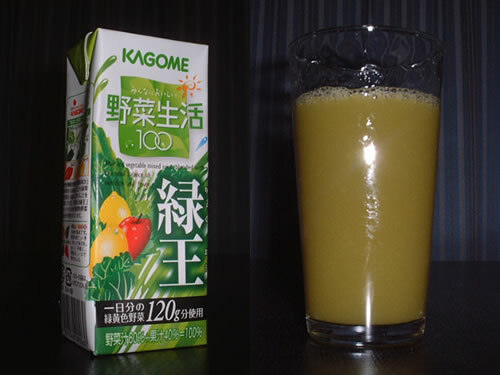 Nobody wants to drink straight vegetable juice even if it's healthy. So how about adding some fruit juice to sweeten it up? Ok but even after adding some apples or grapes, how good can beet or spinach juice really taste? Let's find out! Here's the lineup. Let's start with the original, a mix of 21 vegetables and 3 fruits. 'Wow', you must be thinking, 21 vegetables? Do even that many vegetables exist? And only three lonely fruits. However the box tells me that even though there are 21 veggies, the percent of fruit to vegetable juice is 50/50. So how is it? Well it definitely started off on the right foot. The colour was a nice dark orange. Not the orange of oranges, but more like carrots. The taste was also pretty darn good! 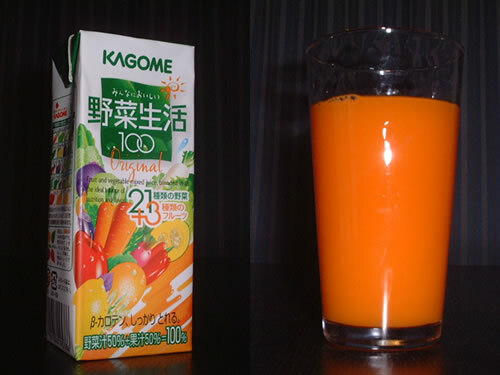 You could definitely taste the carrots, but the fruit juices complimented it very nicely. You gotta wonder though, at 50% and with 21 vegetables, how much eggplant or squash really gets into this box? A sliver? Maybe they stick a pin into an eggplant then dip it into the mix. As long as there's a few molecules in there we can't call them liars I guess. Vegetables: (Ready?) Carrots, Spinach, Asparagus, Red Pepper, Chinese Cabbage, Cressen, Squash, Red Cabbage, Broccoli, Petit Vert, Beet, Red Beefsteak Plant, Celery, Lettuce, Nappa Cabbage, Kale, Parsely, Eggplant, Onion, Radish, Cabbage (whew). Fruity, just a hint of vegetable. Just sweet enough, creamy and smooth. Healthy and delicious! 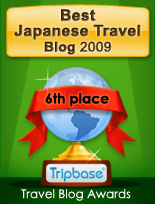 Nice job Kagome! Actually I've tried the original many times in the past so I knew what to expect. However it'll be my first time to try this next one called 'Red Vegetable'. It's not a new one, but I never felt the urge to drink tomatoes and fruit together before. This time we have a mix of only 8 veggies and 6 fruits and once again the mix is 50/50. 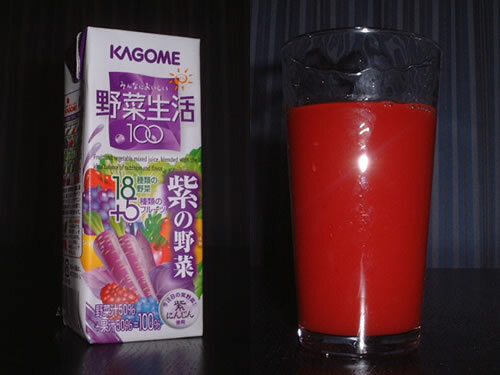 First off, the colour is nice, it looks like fruit punch, but the taste? Well here goes. Hmmm.... The initial taste is mostly apple, but then the tomato kicks in after and reminds you that it's not fruit punch after all. Not bad but not that good either. Fruits: Apple, Grapes, Lemon, Grapefruit, Dragon Fruit, Acerola. Vegetables: Tomato, Red Pepper, Parsely, Spinach, Beet, Kale, Cressen, Asparagus. Like apple, but a weird tomato undertone. 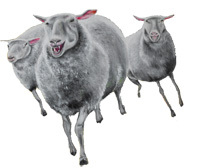 Gotta love their graphic designer. Not bad, but I'll stick with carrot juice. 'Green Vegetable' is another one I'm not too familiar with, this one might be one of the new ones or else they changed the packaging. Anyway it boasts an impressive 21 vegetables and 4 fruits, but this time the ratio is 65% vegetable to 35% fruit, so maybe this is the one to go for if you forget to eat your salad for dinner. To start with, although I like green, it's not a colour you normally associate with a refreshing drink. When you're presented with a green drink you just know it's full of vegetables and that it most likely tastes like crap. So did it? I hoped to be proved wrong but unfortunately I wasn't. The extra spinach and broccoli really comes through and the sweetness of the fruit only makes you want to gag more. Strong unpleasant aftertaste as well.... Back to the drawing board on this one guys! Fruits: Apple, Lemon, Passion Fruit, Grapefruit. Vegetables: Spinach, Carrots, Broccoli, Nappa Cabbage, Asparagus, Petit Vert, Kale, Green Pepper, Molokheiya, Parsely, Radish, Lettuce, Squash, Celery, Chinese Cabbage, Cabbage, Onion, Cressen, Beet, Ashitaba, Green Peas. Give the graphic designer a raise! I have to apologize for the pictures quickly. because of the lighting and my camera, the juices all came out looking much lighter than they really are. Please take my word that 'Purple Vegetable' is really purple and not red like the picture makes it out. On the same note, 'Red Vegetable isn't dark orange like it looks above, but dark red. Anyway 'Purple Vegetable' is definitely one of the newer ones, and I was excited when I first saw it. I mean, who wouldn't get excited by a purple drink? Although their are 18 vegetables and 5 fruits at 50/50, the vegetable taste was pretty much non-existent, which is a plus in my book. It mainly tasted of grapes and was a trifle too sweet. Some interesting veggies in here this time including purple carrots. Is there really such thing? Never heard of 'em. Fruits: Apple, Grapes, Lemon, Blueberries, Raspberries. Vegetables: Purple Carrot, Carrot, Sweet Potato, Red Beefsteak Plant, Red Cabbage, Red Pepper, Cabbage, Eggplant, Asparagus, Celery, Nappa Cabbage, Radish, Kale, Lettuce, Cressen, Spinach, Parsely, Beet, Squash. Like grape juice, a bit too sweet though. Some funky purple carrots on the front! The purple carrots were a nice touch! Another green drink. 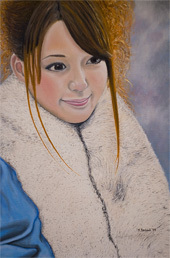 I'm a bit leery now after the other one, does this one promise to be better? Although it looks the same, they simplified things this time round and only used 7 vegetables and 3 fruits. Vegetable content is at 60% though which could mean some unpleasantness coming my way. Well let's get it over with.... Blahhhg! It's chunky! And too much vegetable taste yet again.... They focused almost exclusively on leafy vegetables this time with the main one being something called 'petit vert', (which means 'little green' for those of you not familiar with French). Never heard of it. Vegetables: Petit Vert, Asparagus, Spinach, Parsely, Green Pepper, Cressen, Kale. Hard to describe, kind of harsh. Chunkiness does not a good drink make. 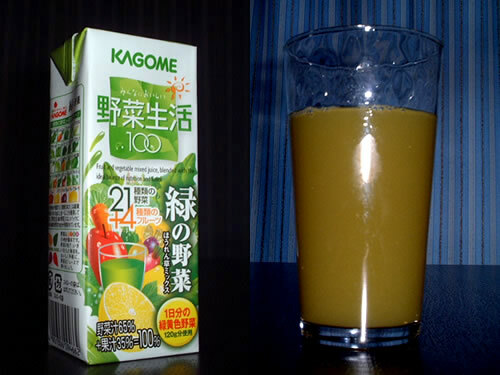 So there you have it, seems that after all Kagome's struggles to add some variety, the original flavour is still the best. As an aside, I'd like to add that these drinks are full of fiber, and after drinking 5 of them in a 24 hour period that fact has become quite clear. Excuse me, nature is calling!